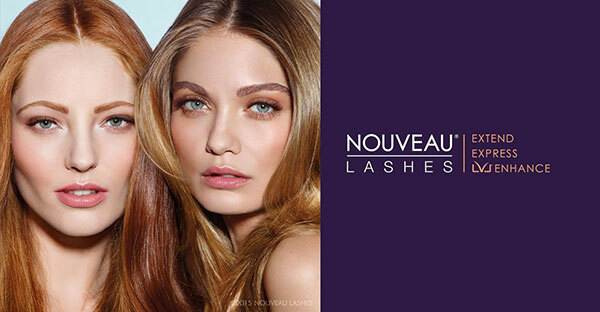 We are proud to offer NOUVEAU Lash Extensions. By far, this is the world’s best professional lash extension system available on the market. We strongly believe in NOUVEAU lashes not only because of the quality of the results, but because of NOUVEAU’s leading reputation as the “healthiest and safest” professional lash system available. Imagine waking up lovely. You are natural and barefaced, and plan to stay that way… all day! The secret to your beauty confidence? The mile-high, sinfully thick, show-stopping lashes framing your eyes! No more messing with mascara! Swim, sleep, sauna and sweat- with no more fear of raccoon eyes! Perfect for women in the middle east, where we have summer weather practically all year round! Unfortunately, all of this sunshine also means messed-up mascara, courtesy of heat, humidity and water sports. What’s a lash loving girl to do? Of course, you could choose to suffer silently with runny raccoon eyes thanks to mascara. Or, you could make like the savviest of girls and open your eyes to NOUVEAU. Long-lasting, weightless and luscious! Just roll out of bed looking gorgeous. See our lash artists for your desired look. From a glamorous gaze ready for the paparazzi to a naturally flirty fringe- kozma lash artists will help you choose the appropriate length, thickness and style to suit your lash and your personality! Description: A full set of state-of-the-art individual lash extensions applied to your natural lash. Nouveau Semi-Permanent Lash extensions are designed to give you thicker and longer lashes. Individual, very fine and perfectly shaped to look like the natural eyelash, synthetic extensions are applied and bonded to your individual lashes using specially developed adhesive. One Nouveau Lash extension is applied at a time directly on to your natural lash, in a specific sequence. This process is repeated until you have a full set to achieve the exact look you want; Natural, Full or Glamorous. The look: Added length and volume with a flawless finish, results look like your own lashes. Maintenance: Needs to be filled between 1-3 weeks anything longer than 3 weeks will be priced at a new full set. Description: In order to maintain the fullness of your lashes and to keep their perfect appearance and condition, we recommend an infill appointment every 1-3 weeks. Your technician will replace any naturally shed lashes and ensure that your natural lashes are still in perfect condition. Looking for extra drama? Want to have beautiful dolled up eyes? Now you can add lashes extensions to your lower lashes. Compliments (but does not include) top lash line. Creates a open eye look that will have you feeling fabulous for days. Perfect for: Short term wear such as special occasions, travel or holiday. Also perfect for busy women on the go! Don’t have time to get a full set of lash extensions? We understand- receive a beautiful set of lashes in just 30 minutes, with our Express Lash service! Maintenance: Lasts in general up to 10 days, sometimes 2 weeks. Low maintenance. Professional removal required, or purchase a take-home deb-bonding removal serum.